2019 begins our 190th year. Given the history of many private schools and Catholic schools, this milestone is impressive. No doubt we have been around so long because we have always focused on making continual improvements to help our students succeed. We have also been able to adapt and change while holding true to our core values. Today we continue to make improvements to better serve our students. In this edition entitled "Building on Success", I'd like to take this opportunity to outline some areas of focus for me when it comes to building on the academic success and rigor of our college preparatory school. The start of a new year brings a time for a fresh start, new opportunities and resolutions to be better you. When the calendar rolled over to 2019 it brought me to Saint John's Catholic Prep as your new Director of Enrollment Management. With excitement, I knew this new chapter would bring opportunities to connect with old friends, meet current Saint John's families and develop relationships with prospective students. Ahoy! Happy New Year! The holidays are over, and I am in full "Soiree-Mode!" The Soiree Committee is busy collecting sponsorships and donations to help make this fundraiser a big success! If you or your friends are interested in sponsoring this event, please call our Advancement office at 301-662-4210 ext. 129. I believe the way one measures success is the surest way to achieve it. Robert Cardinal Sarah says, "Man is not born to manage his bank account; he is born to find God and love his neighbor." When we base success on whether we find God and love our neighbor, then our earthly success bears much more meaning. Viking Athletics churns through our Winter season with both basketballs - Girls and Boys - taking championships over the holidays. While we relaxed and entertained, they excelled in Delaware (Girls) and in the Governor's Challenge at the beach (Ocean City, MD). Happy New Year!! 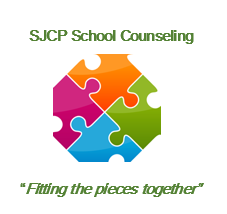 It is a continued resolution of The SJCP School Counseling Department to support the spiritual, emotional and educational success of every student. We are available for consultation, individual counseling, academic support, and college preparation. 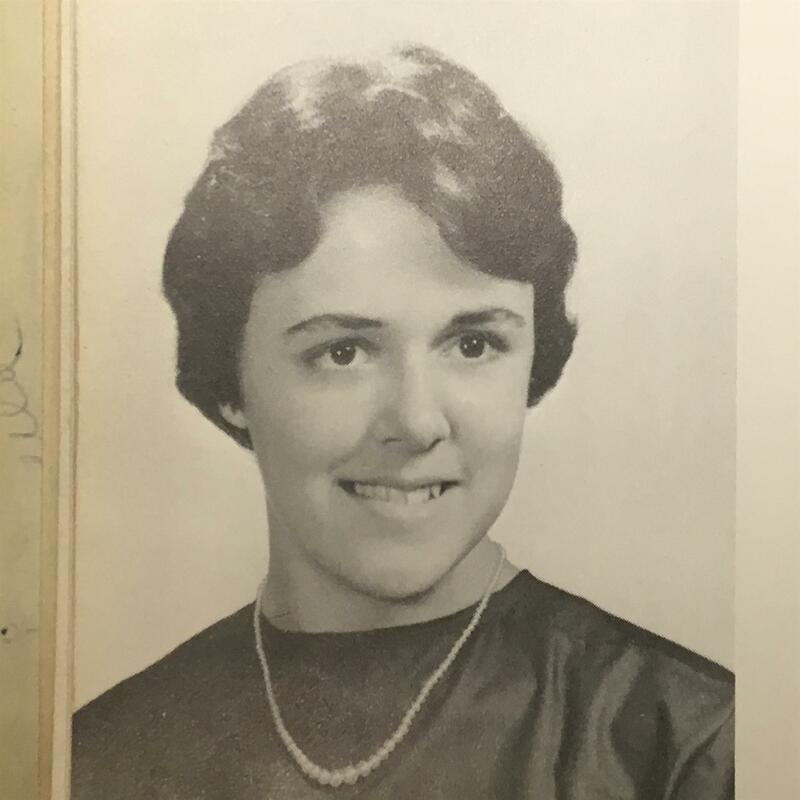 Her senior quote was "From a little spark will burst a mighty flame" which aptly describes the petite, always smiling Sherri Bowman, or as the members of the Class of 1963 may remember her, Sherriann Gregoire. 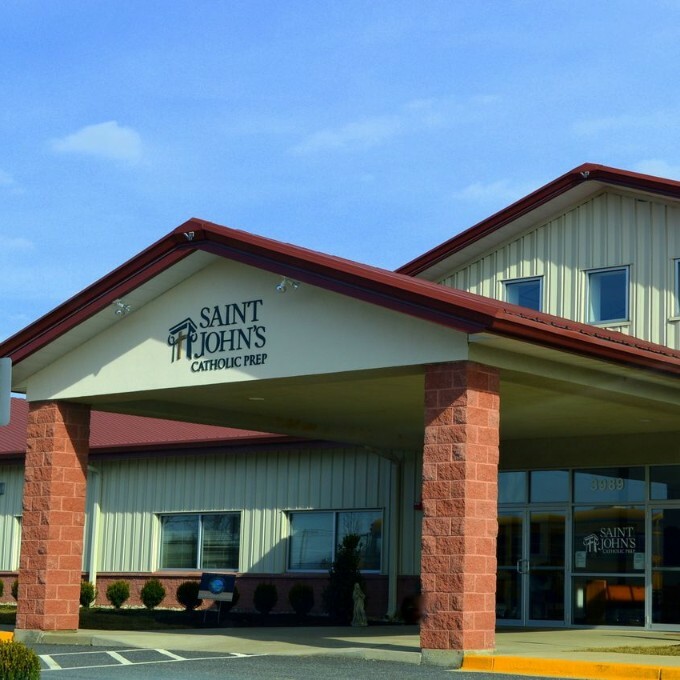 Born and raised in Frederick, Sherri attended Saint John's Elementary School from first through eighth grade, then went on to graduate from Saint John's High School in 1963. 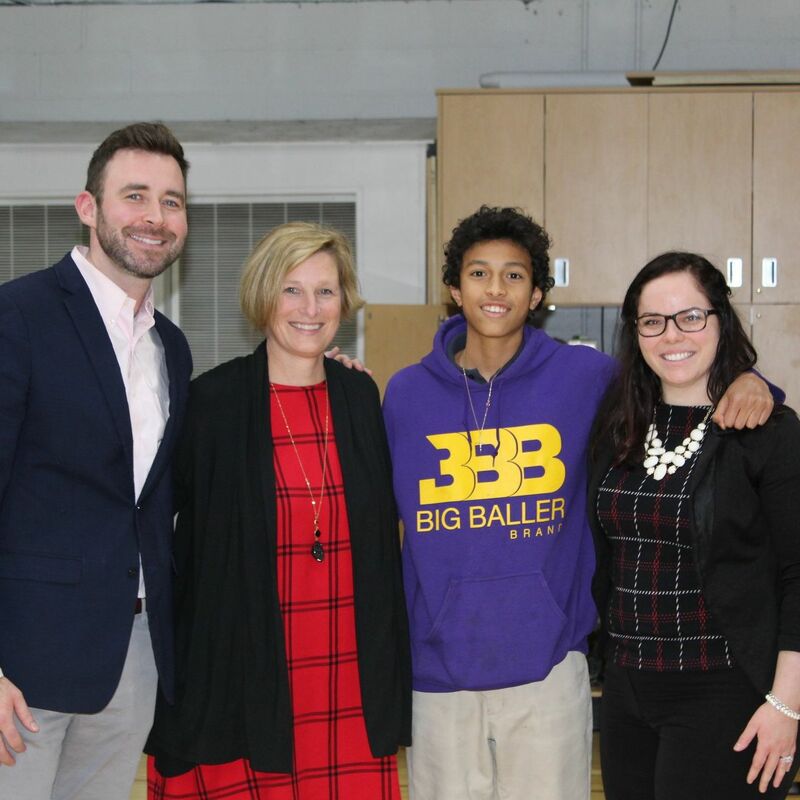 Before the boy's basketball game on January 10, the SJCP Athletic Department honored Senior Bryce Hill. 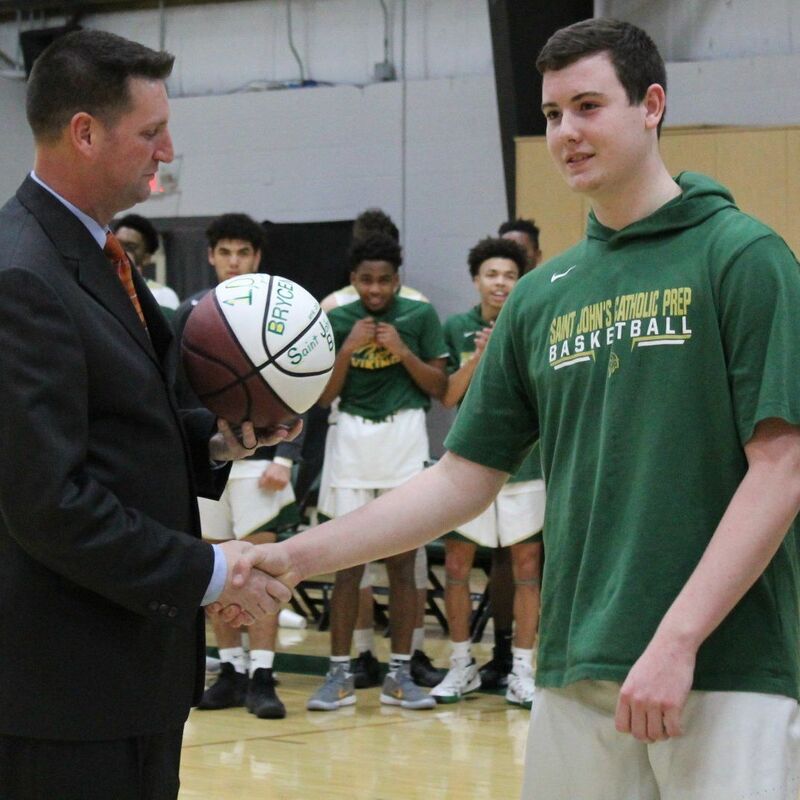 for scoring his 1,000th varsity point as an SJCP Viking. Bryce is also one of the team's captains and a great leader on and off the court. Congrats, Bryce! 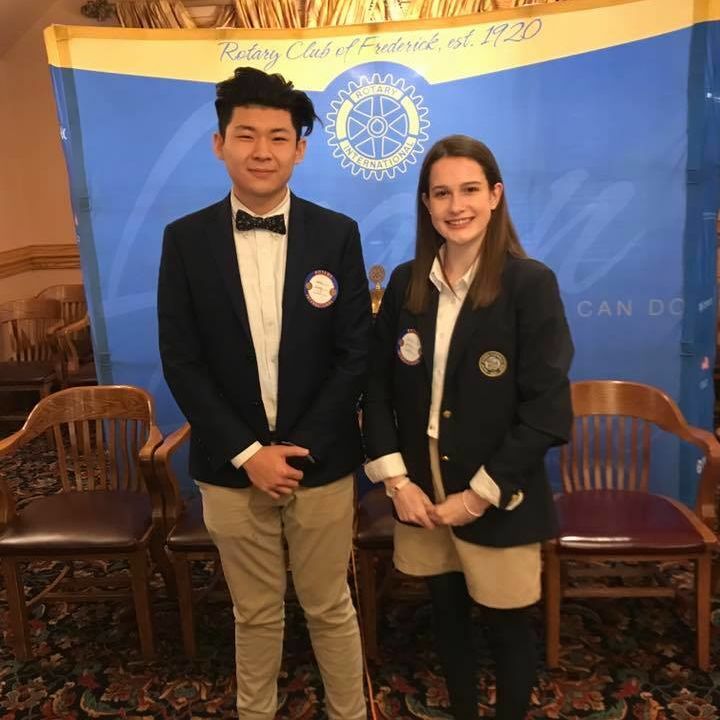 Charles Wang and Emily German attended the meeting of the Rotary Club of Frederick at Dutch's Daughter. They will be guests of Dr. Greg Rausch for the next three Rotary meetings. Dr. Rausch is not only a Rotarian but a member of the SJCP Board of Trustees. The meeting presentation was sponsored by the Frederick County Office of Economic Development and featured their selection of the Top 50 CEOs in Frederick County. 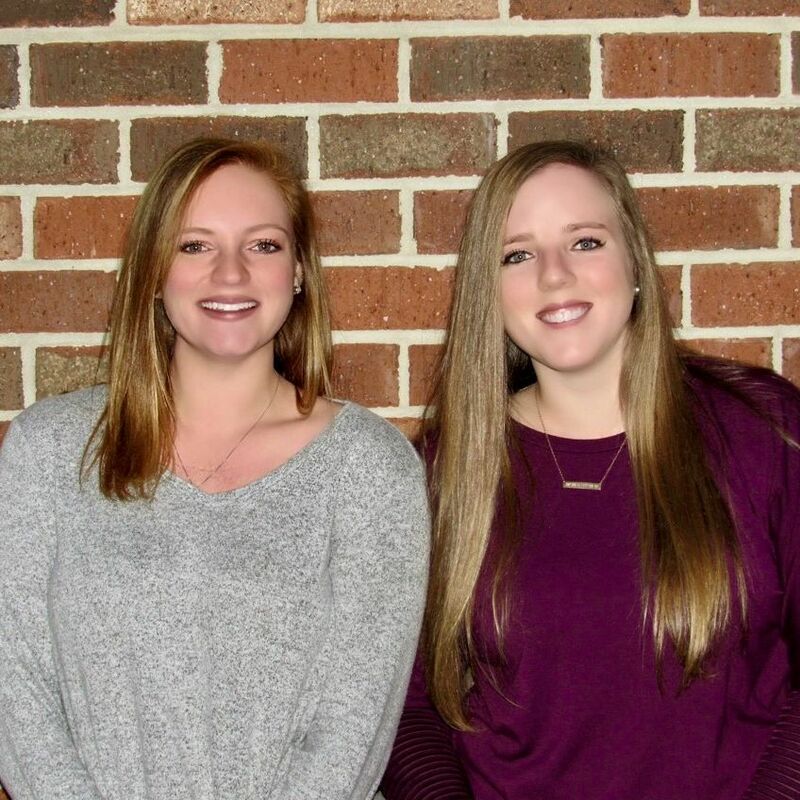 Saint John's Catholic Prep welcomes two new coaches, Madison Murphy and Danielle Barbeito, to lead the Girls' Lacrosse team. Madison Murphy, Saint John's Catholic Prep's Head Girls' Lacrosse Coach, has been a high school player, a noted college player, a high school coach AND a collegiate coach. Saint John's is just happy that she is now OUR Coach! 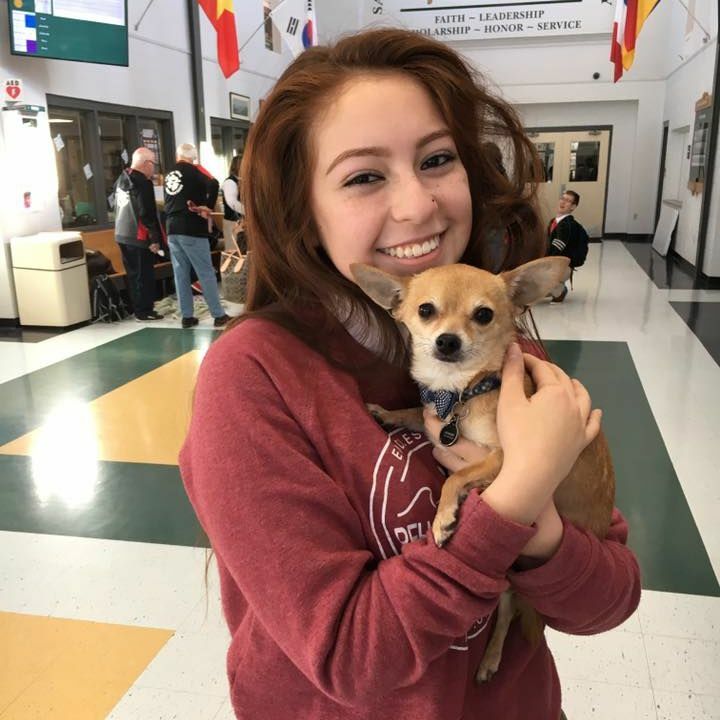 During exam week, our counseling department arranged for the Go Team Therapy Dogs to be in the Great Hall to provide some much-needed stress relief for our students. 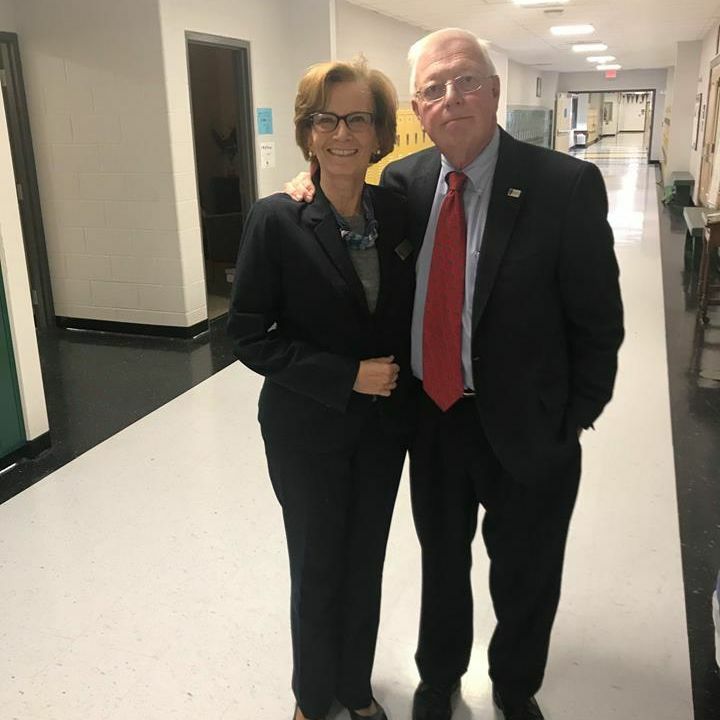 Dr. Donna Hargens, Superintendent of Catholic Schools for the Archdiocese of Baltimore visited SJCP. It was great to share all that makes SJCP such a wonderful school! Ed Wright and Scott Myers from Lebanon Valley College were on campus with us today. 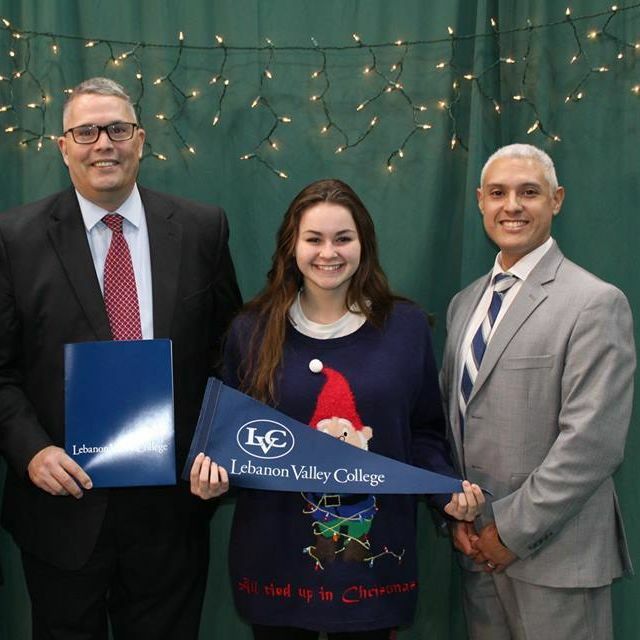 LVC is one of the colleges in the Guaranteed College Acceptance Program through our Counseling Office. If an SJCP student has a 3.0 GPA + 1080 SAT score they will receive acceptance with a $16,000 per year minimum scholarship. 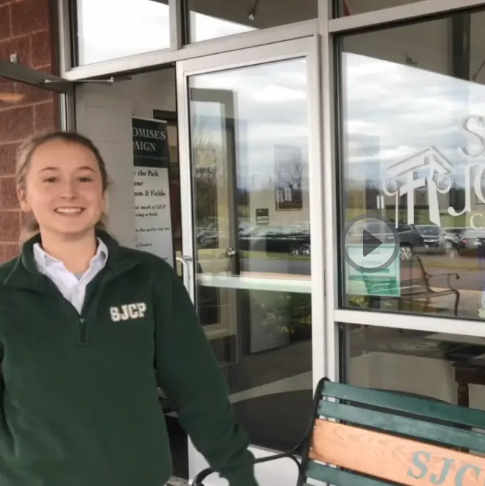 Students in our Video Productions Class created a commercial for SJCP. They say that where you go to high school matters... and that's why they go to SJCP! Saint John's welcomed visiting middle school families onto campus for Middle School Basketball Night for the girls' basketball game against McDonogh. Congratulations to the winner of the $500 SJCP scholarship for the 2019-2020 school year, Alejandro Ford! Thank you to all the middle school families who came out to cheer on our Lady Vikings and support our event! 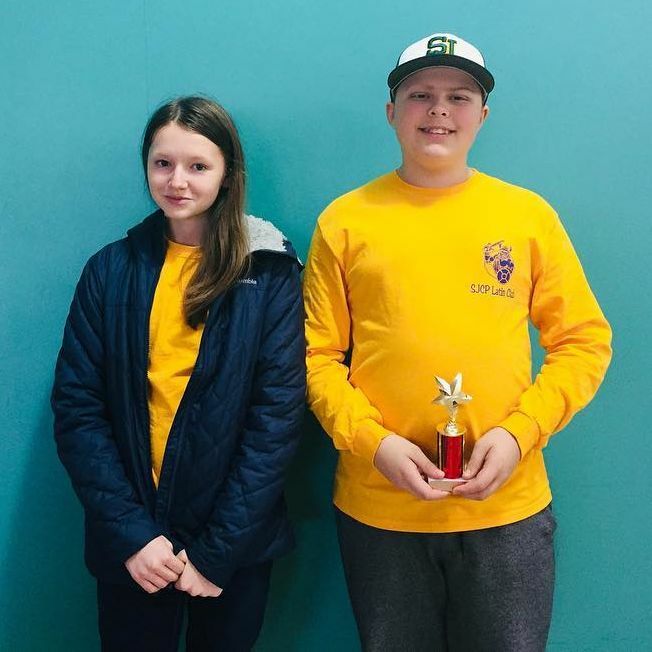 The Science Olympiad team traveled to the National Cathedral School in Washington DC for the first competition of the year. Students participated in 23 events in many fields of science including thermodynamics, circuitry, chemistry, and environmental science. 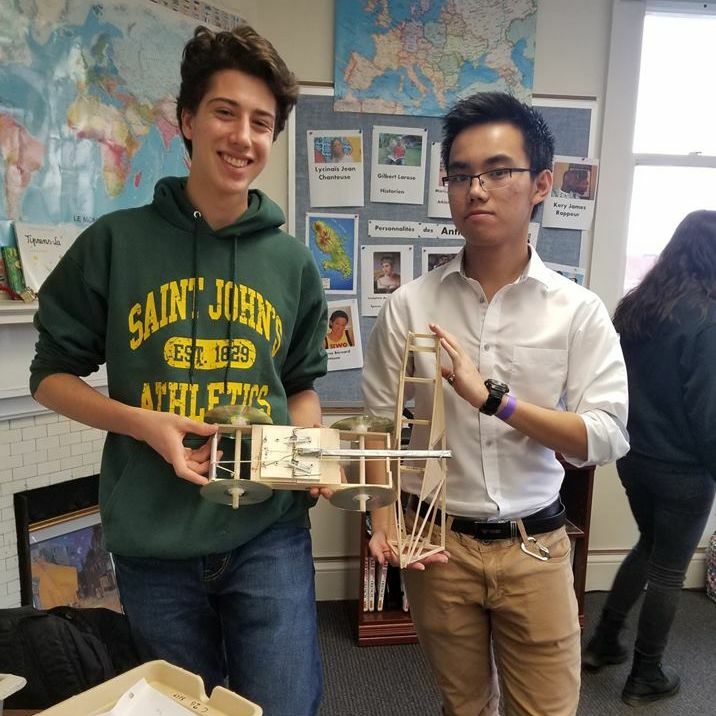 Students built and brought two airplanes, a mousetrap car, a boomilever, and a musical instrument to the competition. 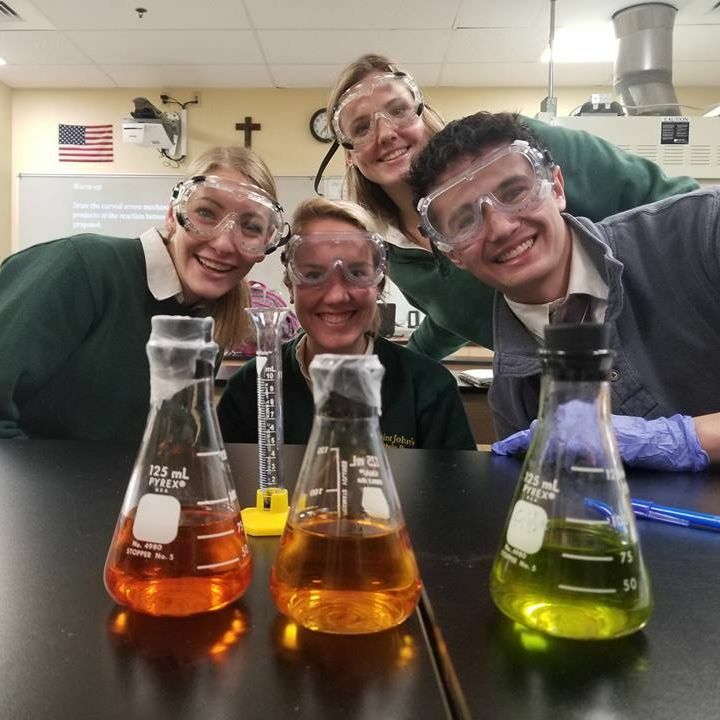 Honors Organic Chemistry students perform the colorful reversible oxidation of indigo carmine while studying the reactions of carbonyls. 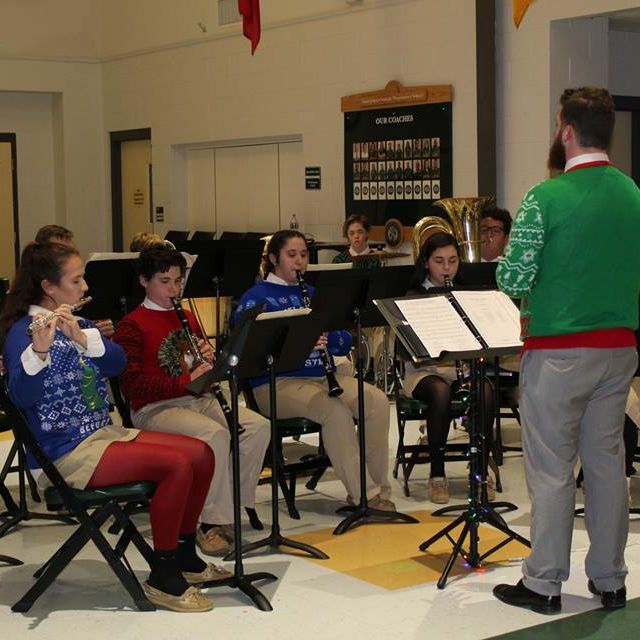 The SJCP Great Hall was filled with families and friends from our community as the Music Department treated us to their concert, "Winter Moods." Students from our Guitar Studio, Percussion Ensemble, and Wind Ensemble classes each performed 3-4 songs and did a FANTASTIC job! Congratulations to Mr. Cliber, Mr. Ross, and all of our students for putting on a great performance! 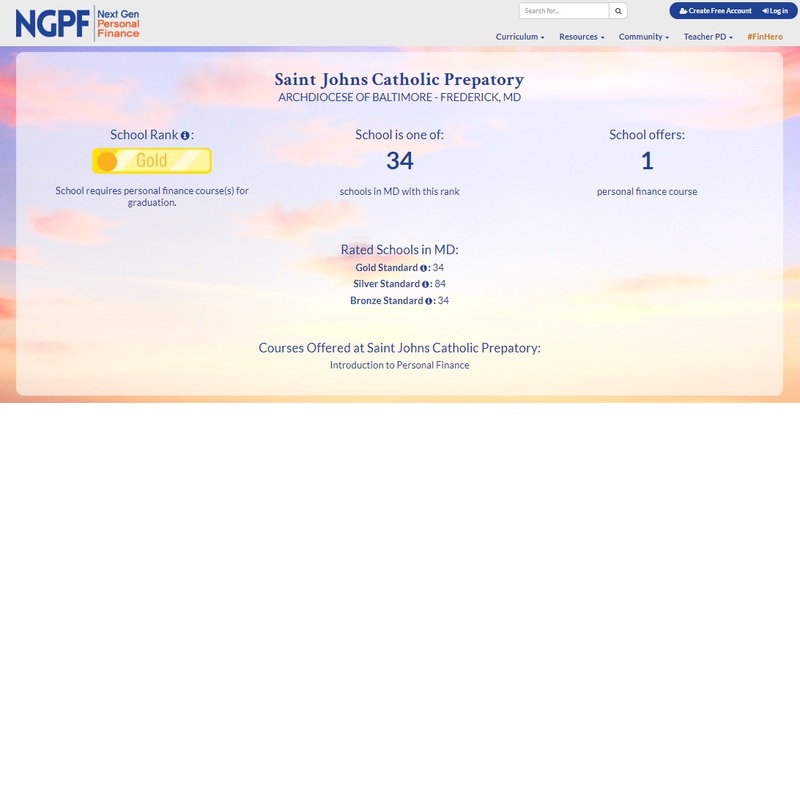 Saint John's Catholic Prep has been given the Gold Rank by the Next Gen Personal Finance group for requiring all students to take a semester of Personal Finance. SJCP is only 1 of 34 schools in the entire state of Maryland to have this distinction. Thank you to Mrs. Thomas for her efforts and doing such a great job with this course! 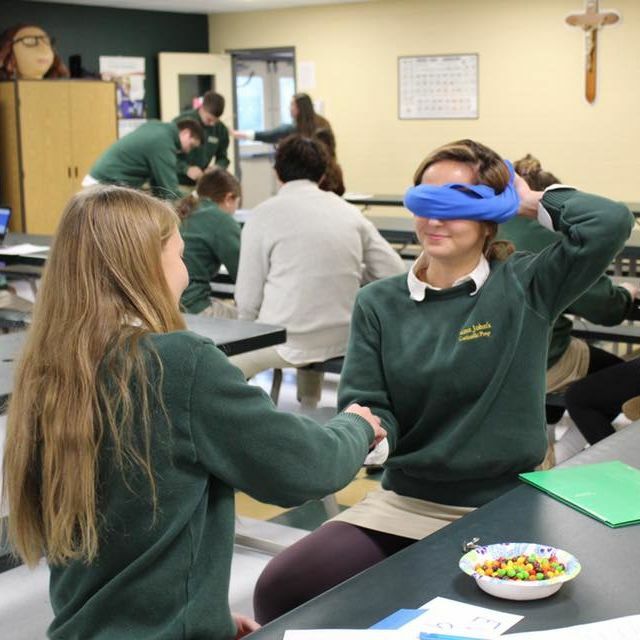 The AP Psychology class held a Sensory Olympics. They tested their powers of sensation and perception with a variety of events, including memory tests, balance competitions, and smell and taste identification challenges! 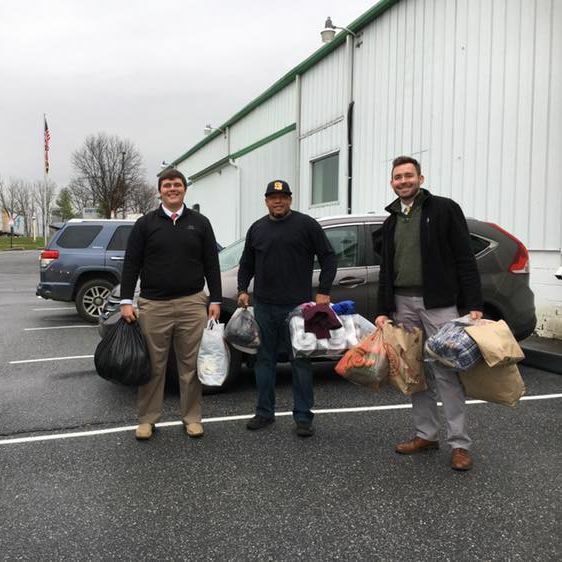 Senior Michael Haley, Mr. Keys, and Mr. Knotek delivered the items we collected before Thanksgiving during the Winter Warm-Up clothing drive. These items will be distributed by SHIP to help students in Frederick County this winter. Thank you to everyone who made a donation to help those in need stay warm this winter. SJCP students, from a variety of classes, traveled to Philadelphia to explore the city. 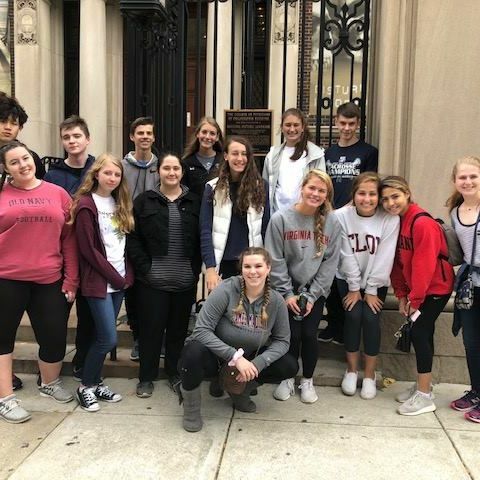 AP US History students visited Valley Forge and locations in downtown Philadelphia, including Independence Hall, Elfreth's Alley, and the new Museum of the American Revolution. 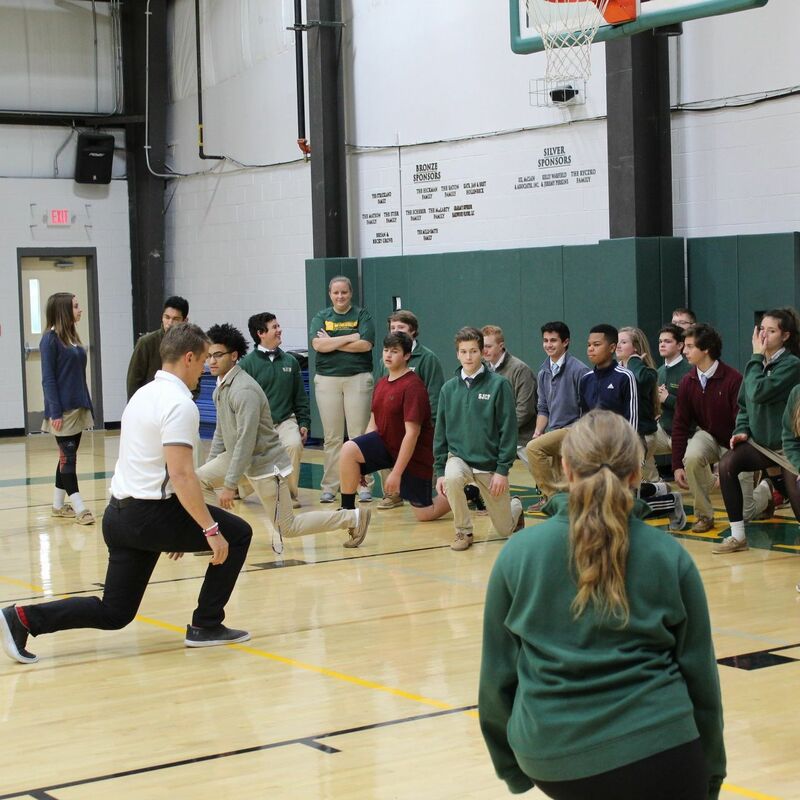 Dr. Josh Funk, Chief Executive Officer at Rehab 2 Perform, visited Saint John's to work with many of our classes and share his knowledge and expertise of fitness with our students. Rehab 2 Perform has partnered with SJCP to manage all aspects of our athletic training program.